ذاکرحقیقی, کیانوش, حاجی‌بابایی, سعید. (1396). تدوین سیاست‌های ارتقای محیط‌های دوستدار کودک مبتنی بر ترجیحات محیطی کودکان (نمونه مطالعاتی: کودکان حاضر در فضاهای عمومی منطقه 6 شهرداری تهران). فصلنامه جغرافیا ( برنامه ریزی منطقه ای), 29(1), 105-116. کیانوش ذاکرحقیقی; سعید حاجی‌بابایی. "تدوین سیاست‌های ارتقای محیط‌های دوستدار کودک مبتنی بر ترجیحات محیطی کودکان (نمونه مطالعاتی: کودکان حاضر در فضاهای عمومی منطقه 6 شهرداری تهران)". فصلنامه جغرافیا ( برنامه ریزی منطقه ای), 29, 1, 1396, 105-116. ذاکرحقیقی, کیانوش, حاجی‌بابایی, سعید. (1396). 'تدوین سیاست‌های ارتقای محیط‌های دوستدار کودک مبتنی بر ترجیحات محیطی کودکان (نمونه مطالعاتی: کودکان حاضر در فضاهای عمومی منطقه 6 شهرداری تهران)', فصلنامه جغرافیا ( برنامه ریزی منطقه ای), 29(1), pp. 105-116. ذاکرحقیقی, کیانوش, حاجی‌بابایی, سعید. تدوین سیاست‌های ارتقای محیط‌های دوستدار کودک مبتنی بر ترجیحات محیطی کودکان (نمونه مطالعاتی: کودکان حاضر در فضاهای عمومی منطقه 6 شهرداری تهران). فصلنامه جغرافیا ( برنامه ریزی منطقه ای), 1396; 29(1): 105-116. علی‌رغم توجه به ضرورت ایجاد محیطی مناسب برای رشد کودک و آشنایی با نیازها و سرشت فطری او برای رسیدن به آن تعالی، پژوهش‌های مختلف در این حوزه ترجیحات کودکان مبتنی بر فرهنگ و ساختار ذهنی کودکان را کمتر مورد توجه قرار داده‌اند. هدف این مقاله کنکاش پیرامون ترجیحات محیطی کودکان از طریق بررسی فضاهای بیرونی مختلف شهری بر مبنای الزامات کنوانسیون شهر دوستدار کودک به منظور تدوین شرایط و معیارهای طراحی بر اساس شرایط محلی است. بدین منظور، با استفاده از روش میدانی نظر خردسالان در ارتباط با فضاهای مختلف بیرونی مورد استفاده از جنبه‌های مختلف مورد‌نظر تحلیل می‌گردد. نتایج تحلیل‌ نشان‌دهنده تفاوت آشکار میان ترجیحات خردسالان در مقایسه با معیارهای متداول برای طراحی فضاهای کودکان و در مواردی تضاد آشکار در میان خواسته‌های ایشان مبتنی بر روحیه زندگی کلان‌شهری است. برای مثال، مطالعه نشان می‌دهد علی‌رغم دوری فضاهای شهری مانند پارک ساعی از منزل کودکان پاسخ‌دهنده، به دلیل وجود تعداد زیادی از عوامل شش‌گانه مورد بررسی، کودکان حضور در این فضاها را بر فضاهای نزدیک به منزل ترجیح می‌دهند. مقاله درنهایت به تدوین سیاست‌های ارتقای محیط دوستدار کودک به شیوه‌ای بومی مبتنی بر 4 هدف سرزندگی، انعطاف، خاطره‌انگیزی و ایمنی و البته ترجیحات خردسالان می‌پردازد. Despite the importance of preparing a proper and friendly environment for children growth, few researches in this field investigate children’s environmental preference on the basis of their culture and their mental structure. The article tries to investigate children’s environmental preference via surveying different outer spaces and in accordance with requirements of child friendly cities convention. Literature review show that most practical experiences in this filed concentrate on desirability of place on the basis of parental viewpoints and because of different challenges including problematic obtaining rigid and trustable viewpoints form children, few research has investigated children’s environmental preference. Qualitative research method is chosen and interviews and observations are concentrated on different aspect of environment features including meaningful and instructive environment; territory; hidden places; and finally freedom of speech. For understanding children reaction and their satisfaction rate in different environments, these environments are classified in a way that they can easily distinguish these spaces. These classification include local designed open spaces, local organic open spaces, streets, designed open space in district scale, historic buildings and monuments, neighborhood unit, block scale, and private spaces. Children viewpoints about these different outer spaces are gathered and analyzed. 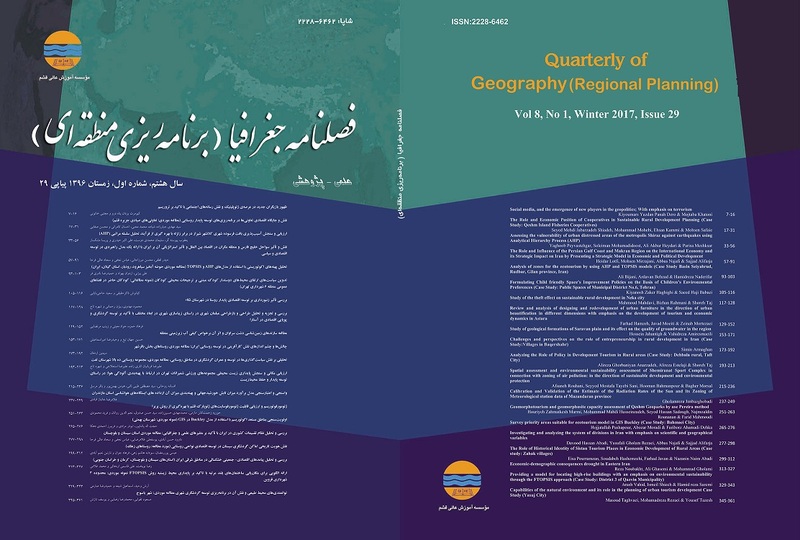 Results show the distinct difference between children’s environmental preference in comparison with standard design criteria and also distinct difference between their preferences according to the spirit of urban life in Tehran. Finally, the article tries to formulate improvement policies for child friendly urban spaces on the basis of livability, flexibility, reminiscence, safety and at last children’s preference. Ariès, P. (1962). Centuries of childhood; a social history of family life. New York Knopf. Bartlett, S. (2002). The problem of children's injuries in low-income countries: a review. Health Policy and Planning Journal, 1-13. Chawla, L., & Heft, H. (2002). Children's Competence and Ecology of Communities: A Functional Approach to the Evaluation of Participation. Environmental Psychology, 22, 201-216. Dudek, M (2005) Children’s spaces. Oxford: Architectural Press. Doll, B. (1996). Children without Friends: Implications for Practice and Policy. The School Psychology Review 25(2): 165-183. Hartup, W. W. (1991). Having friends, making friends, and keeping friends: Relationships as educational contexts. Early Report, 1-4. Horelli, L. & Prezza, M. (2004). Child-Friendly Environments: Approaches and Lessons. Helsinki University of Technology, Center for Urban and Regional Studies. Jorgensen, B.S. and R.C. Stedman (2001). Sense of Place as an Attitude: Lakeshore Owners’ Attitudes toward Their Properties, Journal of Environmental Psychology 21: 233-248. Korpela, K. (1989). Place-identity as a product of environment self-regulation. Journal of Environmental Psychology, 9, 241-258. Maas, J., Verheij, R. A., de Vries, S., Spreeuwenberg, P., Schellevis, F. G., & Groenewe-gen, P. P. (2009). Morbidity is related to a green living environment. Journal ofEpidemiology and Community Health, 63(12), 967–973. Mohd Latfi, M.F. & Abdul Karim, H. (2012), Suitability of Planning Guidelines for Children Playing Spaces, Procedia - Social and Behavioral Sciences, Volume 38, Pages 304–314. patton, M. Q. (1990). Qualitative Evaluation and Research Methods, 2nd ed. Newbury Park, CA: Sage. Postman, N. (1982). The Disappearance of Childhood. New York: Vintage Books. Qvortrup, J. (Ed.). (2005). Studies in Modern Childhood: Society, Agency, Culture. New York: Palgrave Macmillan. Racelis, M. & Aguirre, A. D. (2002). Child rights for urban poor children in child friendly Phillipine cities:views from the community. Environment & Urbanization, 97-113. Read, D. W., & Russell, G. (1996). A method of taxonomic typology construction and an example: Utilized flakes. American Antiquity, 61(4), 663-684. Riley, R.B. (1992). Attachment to the Ordinary Landscape. In I. Altman and S.M. Low, eds. Place Attachment. New York: Plenum Press, 13-35. Sack, R. D. (1986). Human Territoriality: its theory and history. Cambridge: Cambridge University Press. Valsiner, J. (1997). Culture and the development of children's action: a theory of human development. 2nd ed. New York: Wiley. Wolfe, M. & Laufer, R. S. (1975). The concept of privacy in childhood and adolescence. In D. H. Carson (Ed. ), Man-environment interactions: Evaluations and applications. Part II. Strousberg, PA:Dowden, Hutchison & Ross, 1975.